Many fled the killings by canoe and had no time to take anything with them as they paddled for their lives across Lake Chad. Now thousands of Nigerians who escaped attacks by Boko Haram are stuck on some of the countless little islands that dot the lake and are in dire need of food, water, shelter and medical care. Unless these refugees can be located and moved to an established refugee camp at Baga Sola, 70km from the Nigerian border, “they are going to remain extremely vulnerable where they are,” said Alice Armanni Sequi, head of the UN Office for the Coordination of Humanitarian Affairs (OCHA) in Chad. Many of the islands are little more than swampy marshes or sandbars. While some are inhabited, their residents have little to offer the refugees except their homes: Chad’s Lake Region is one of the poorest parts of one of the poorest and least developed countries in the world. In some communities, the recent influx has more than doubled the population. “The current situation is quite complex,” said Mamadou Dian Balde, the deputy representative for the UN Refugee Agency (UNHCR) in Chad. “Many of the refugees have settled in places where we cannot provide them with any support, even though we desperately want to,” he said, explaining that some of the islands are at least a day’s motorboat ride from the shore. More than 17,000 Nigerians have taken refuge in Chad since May 2013, according to UNHCR. 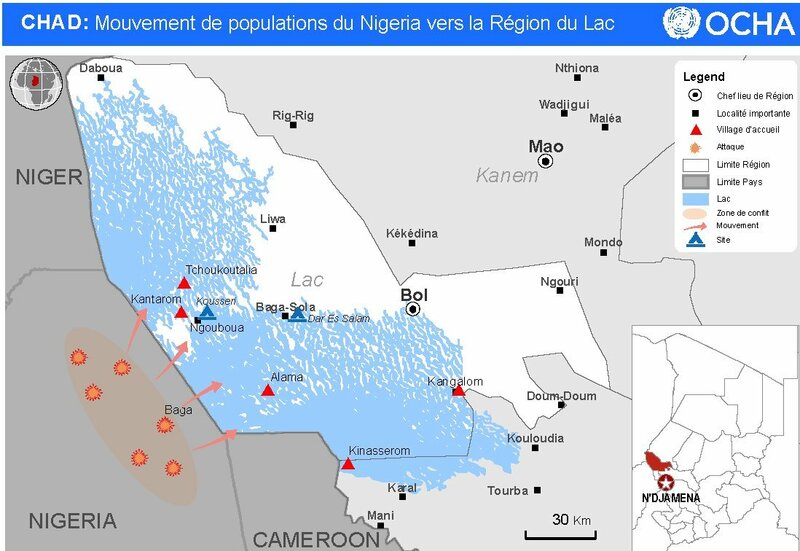 An additional 100,000 have fled to Niger and 37,000 to Cameroon. The biggest influx into Chad - more than 14,000, at a rate of up to 1,000 a day - followed Boko Haram’s 3 January attack on the northeastern Nigerian town of Baga. Hundreds of people were killed and entire villages burned. More than one in five of the new arrivals lack any form of shelter, according to the International Federation of Red Cross and Red Crescent Societies. The camp at Baga-Sola, known as Dar-es-Salam (“place of peace”) can house 15,000 refugees and is currently hosting just over 3,000. UNHCR is working with the Chadian government to transport an additional 2,000 refugees on the islands to the camp. The Ministry of Public Health has posted doctors and nurses in Dar-es-Salam and added extra health workers to communities hosting large numbers of refugees. Disease and outbreaks, such as malaria and cholera, remain of concern, however. And in this part of Chad, maternal healthcare is next to non-existent. Local authorities say they know of at least 1,100 Chadians who had been living and working in Nigeria and who fled back home when the violence erupted. Aid agencies say the actual number is probably much higher. The return of these breadwinners has cut off a financial lifeline for many families. In the Lake Region, almost a third of the population does not have regular access to enough food to live a healthy life, according to the UN’s World Food Programme. Malnutrition rates among children under five exceed the emergency threshold of 15 percent. The economic situation has been made worse by the closure of Chad’s land border with Nigeria in August, which halted the movement of local traders, herders and merchants, and has led to food shortages and rising food prices. According to OCHA, some $31 million is needed to meet humanitarian needs in the Lake Region, including those of the refugees. How much of this will come through is uncertain: last year’s Chad appeal was just 36 percent funded. WFP, which has supplied more than 6,000 refugees with emergency food rations, and has begun distributing one-month rations to people in the camp, says that it will need nearly $11 million to meet the needs of everyone. OCHA says it is now reaching out to the Central Emergency Response Fund (CERF) to support aid operations in response to the Nigeria crisis. For the moment, many agencies have been fronting their internal cash to ensure the immediate response, Sequi said, but added that this is not sustainable, nor will it allow for any scale-up. The UN says it is planning for the arrival of many as 30,000 Nigerian refugees over the coming months, depending on the security situation.